THE LATINA CHRISTMAS SPECIAL: You’ll laugh, you’ll cry . . . you’ll want to dance SALSA? For most of us, the Holidays are all about the warm and fuzzies that come with family togetherness, making “tamales, lechon asado, coquito, ponches y champurrado” and just enjoying these moments with everyone we sometimes don’t get to see all year long . . . all those beautiful, priceless, memory-making-moments . . . whose very thought makes some of us just plain want to run for the hills! The warm and fuzzies are quickly replaced by the fear that sets in with the “sinister” side of Holiday celebrations . . . The pit in your stomach . . . The overwhelming sense of dread . . . The hives . . . The shivering . . . The way your face immediately cringes when you hear your tia visiting from Mexico say something utterly embarrassing! Oh those, when-are-you-getting-married-and-having-a-baby moments! And God forbid you invite a friend or a significant other! The family nicknames, the pictures, the video! But I wouldn’t trade my family or culture for anything in the world! For these moments, as bury-my-head-in-the-sand embarrassing as they may be, are uniquely mine . . . or so I thought! Coming from traditional Latino families, our experiences are probably not like the ones depicted on classic American television shows. Ours, have a little more color and a whole lot of flavor! And THAT is where The Latina Christmas Special comes into play! My very first “helping” of The Latina Christmas Special was last year. One of the three comedic actresses in the show, Maria Russell, is one of my dance instructors and a very dear friend of mine, and of course, I went to support! I cannot in mere words express how much I loved the show! It got me on a personal level, and so I reminisced, I cried, I laughed, I wanted to dance Salsa in the theater aisles . . . it truly did tug at my heartstrings. If you are Latino, you can probably relate to each of the three magnificent ladies that this show revolves around. And if you are not Latina, it sure makes you wish that you were! Seriously though, Latino or not, there is something there for each of to identify with. The show is about three first-generation Latinas who get together over the Holidays and as the wine endlessly pours, the nightmare-evoking stories of Christmas past begin to surface. The stories are told by: Diana Yanez, a Cuban-American from Miami, Sandra Valls, a Mexican American from Laredo, Texas, and Maria Russell, a “Mexi-thuanian”, how she often describes herself as, is the daughter of an over-dedicated and protective Mexican mother and a compliant Lithuanian father. The show was created by Diana 3 years ago. She used to refer to it as, “the little show that could” upon premiering in 2013 and selling out all four of its nights at a small theater. It was brought back in 2014 and it sold-out its 9-night engagement. Amongst those in attendance last year was Director Geoffrey Rivas, whose film credits include: La Bamba, Born In East LA, Blood In Blood Out (Bound By Honor), Luminarias, Under The Tucson Sun and Foto Novelas, for which he won an ALMA Award in 1998. Upon seeing it for the very first time, he decided to return for a “second helping” the next night and confirmed his initial gut feeling, that there was a lot of talent, promise and potential here and he decided to take this laugh-out-loud trio under his wing and make it an even bigger production in 2015, with a 5-week run at The Los Angeles Theater Center and presented by The Latino Theater Company. I attended Grand Opening Night and I can honestly say that, again, the stories shared, touched me at different levels, culturally and emotionally, and served as a reminder of just how beautiful and rich our traditions truly are. To have these three lovely ladies put themselves [and their families] out there and share very personal stories of Christmas past just to make us laugh or evoke even the slightest giggle, makes this laugh-out-loud trifecta’s show that much more endearing. 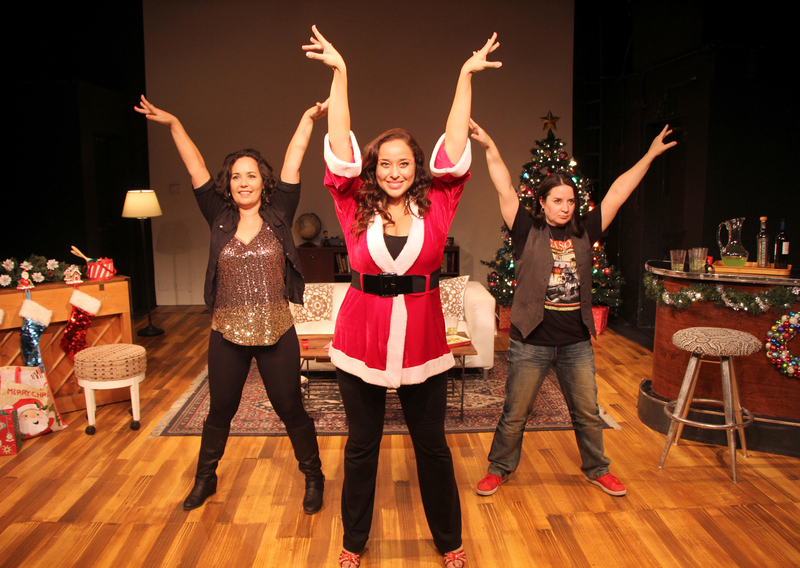 Vulnerability and humor take center stage and makes The Latina Christmas Special, “special”, and an instant Holiday tradition! So grab a steamy mug of “champurrado” or a “Christmas-rita” at the theater bar and treat yourself to some feel-good humor this Holiday season! DS: What in the world inspired you to collaborate with these two crazy women and share very personal stories of your Christmases growing up? DY: When I came up with the idea, I wanted to do sort of a miniature one-woman show. I’m a big fan of stories, I love stories! I always have ever since I was a little girl. I remember that I would get scared at night if I had a bad dream and I would jump into bed with my parents and my mother would soothe me by telling me stories of Cuba and about her youth, and that would always make me feel safe. I love it when I get together with my friends and we share personal stories. And so, I already knew this was something I wanted to incorporate into a show. When I decided to go “Latina” and focused on a theme, my first choice was Christmas. Then it was a matter of “whom”, obviously I couldn’t get all my friends to be the “storytellers.” I wanted to pick two other women that really had distinct, strong, personalities that I also thought were hilarious but would also present a balance so that we may have three different types of Latinas. I think it is pretty obvious that at our core and hearts we are the same: we’re soulful, we’re open, we love to laugh and we love to see things with humor, we’re also very different women. And that’s what I wanted! I wanted to represent different types of Latinas, and that’s how I decided upon Maria and Sandra. MR: So . . . I didn’t want to do it at first because I am so use to hiding behind a character. Something like this encompasses vulnerability; it’s very exposing. I’m exposing myself and my personal life, and it’s all real. When I am doing TV and film I am hiding behind a character. So at the beginning when Diana asked me I responded with a lot of self-doubt and said, ‘I don’t know if I can do that . . .’ We have a mutual coach and when she got wind of this, she very matter-of-factly said, ‘oh you’re doing it!’ And what I discovered in the process was how lucky I was. I went back into “The History of Maria” and reevaluated all the good and the bad. I did a lot of crying. And I am usually not one to cry, but it was very emotional to be reflecting back on my life with my parents. And I had an amazing childhood, but there was a time in my life when it was very dark. You came to the show, you know what I’m talking about! I had never before talked about this particular period in my life, and Geoffrey, our Director, was trying to bring these things to the surface and I just didn’t want to put myself out there and talk about it because it made me feel weak to talk about being bullied and feeling fat. That entailed making myself very vulnerable. That, to me, is not even a skeleton in the closet, but it is the one thing that touches me most on an emotional level because it was such a dark time for me because dance was my entire life and to be “fat ballerina”… This was an amazing journey to go through because I had to dig through my entire life. This wasn’t fiction anymore, it was real. I am so happy I did it because it became gratifying, not just professionally, but on a whole other level. I never thought my story would be helping people who could relate to my experiences. Honest to God, at least 10 people came up to me after the show to thank me. It was so unexpected; it was like this big, beautiful, magnificent surprise at the end of the rainbow. That simple “thank you” made me think, “Wow! This is really powerful!” I never expected that! It’s a feel-good story, and I believe everyone can relate to each of us. SV: When Diana phoned me and asked if I was available and willing to collaborate with her and Maria in writing our own story of Christmas I was so excited and honored. What a great idea! I was also anxious and a bit afraid…what will I talk about? Where do I begin? It was and is such a great adventure. I love them both like sisters and respect them so much as artists. It’s truly such an honor to share the stage with them. DS: “A Charlie Brown Christmas”, “Rudolph the Red-Nosed Reindeer”, “The Nutcracker”, “Home Alone”, “It’s a Wonderful Life”, why do you feel that The Latina Christmas Special is one of the those things that is bound to become an instant Holiday tradition, not just for [those “blessed” to be] Latinos, but for everyone who has already seen it and for those seeing it for the first time? DY: Well, I certainly hope it becomes a tradition! In the title, the word “Special” is kind of an homage to all those Christmas specials we watched growing up. As a first generation American, I never watched Hispanic television. But I did watch many Christmas specials, and the whole time I thought, as we discuss it in the show, that those actors were Latinos too! I thought everyone was being represented, and then I realized it was just Caucasian-Americans and it’s interesting because their stories became my stories, and what we are trying to do here is share another origin of American Christmas so that “our” Christmas stories become part of American culture too. People always ask me, “Are you representing Latinos or are you representing Americans? I think that we’re representing both. This is the American experience; there’s 33 million first generation Americans, not just Latinos, who identify with finding that beautiful line between both cultures and that is a uniquely American experience. So I certainly hope that even though we might be one of the first people to start telling these stories that we’re actually encouraging other people to tell their stories as well. MR: I think there is a moral to the story, and that is that no matter who you are or where you came from, you can relate to each of these stories. One of the things I love is when I have young Latinos come up to me and tell me that they feel the exact same way I felt. Even though this is joyous and fun and we laugh, there is a message underneath it all that reassures us that no matter what the level of dysfunctionality, it is ultimately all about love and family and embracing that. It isn’t about being over-the-top-political, or being political period. We spew people with love! SV: I feel that The Latina Christmas Special, will and should be, a Christmas tradition because our stories must be heard and shared from generation to generation. Our stories about growing up Latino in America reflect the experiences of so many Latino-Americans today yet we have no representation of that on television or media, that I know of. This play is touching, entertaining, poignant, reflective, and inspirational…all the ingredients needed to make a perfect Christmas tradition. DS: It is now an obvious tradition with me, what can I and others returning for “seconds”, “thirds”, and even “fourths” this year expect from the “new and improved” Latina Christmas Special? DY: Well, there is certainly a lot more music and a lot more dancing this year, but I think that the biggest difference is that when we threw it together and when I started working on it 3 years ago, I knew I wanted to do 3 mini one-woman shows, but no one had written anything, and so my main focus was shaping the show so that it was a balanced story and we had these three perspectives, and I think that’s what’s different about it this year. When we worked on the characters the second year I only had time to work on the monologue and you couldn’t really consider it a play. And I feel that now, since we’re working with Geoffrey, and we took a lot longer to prepare, because remember, we all have different careers, so this time we really dedicated ourselves to really thinking about it and rewriting it and working on the comedy and talking about our relationships and now we actually have a play! So now, inside the play you will find 3 mini one-woman shows strung together by a Christmas party theme. I believe THAT is the biggest difference. MR: Well, this time around I think the transitions are a lot stronger and the audience learns more about each of us and the dynamics of us together as opposed to separately. There’s a lot of little surprises in between all of them. I think it is actually bigger and better than ever! I mean, we’re at The Los Angeles Theater Center! It’s like, “What, they’re producing us?! What, there’s a budget?! You mean Craig [her husband] doesn’t have to be the valet, bartender and check people in?! Crack! It’s just at a different level, there’s a buzz around us. I think it’s because we are preaching love, everything comes from love and I think that’s what people really respond to, regardless of ethnicity. 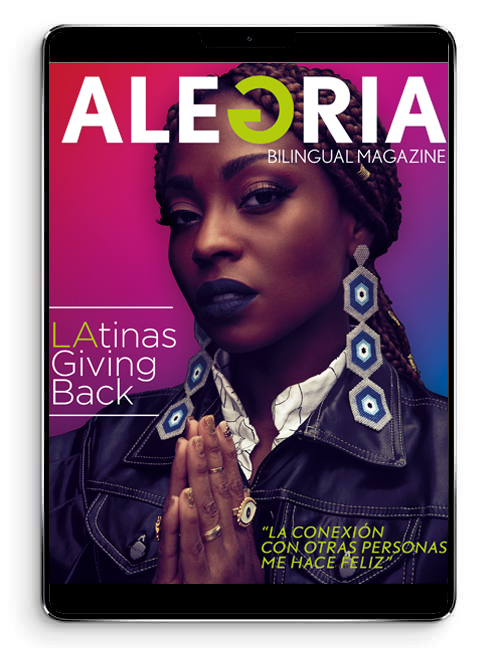 People come up to me and say, ‘I want to be Latina!’ It’s because we have a lot of life, a lot of love, as dramatic as we may be, but at the end of the day we know how to love, we love with all our hearts, and I think that’s what draws people to us. SV: This year we have more music, more dancing, more fun, more humor. We are always improving and rewriting this piece so be prepared for even more entertainment. This year we are in a bigger and better theatre also. DS: What gives you fa-la-la-la-la worthy Holiday ALEGRIA? DY: I have to say its friendship and family and family and friendship. The two. I am so blessed that I have so many wonderful people around me. Not only is my family all alive and still with me today, and I am so very grateful for that, but I have extended family and friendships. And really IT IS all about the love, and I always look forward to every new story I get to experience every year, that eventually ends up making it into my stand-up comedy or my writing. MR: What gives me ALEGRIA during the Holidays is, “pozole, mole, champurrado, tequila y la bulay…” And Salsa! . . . Dancing! *Note: you NEED to see the show to know what she means by, “la bulay”!